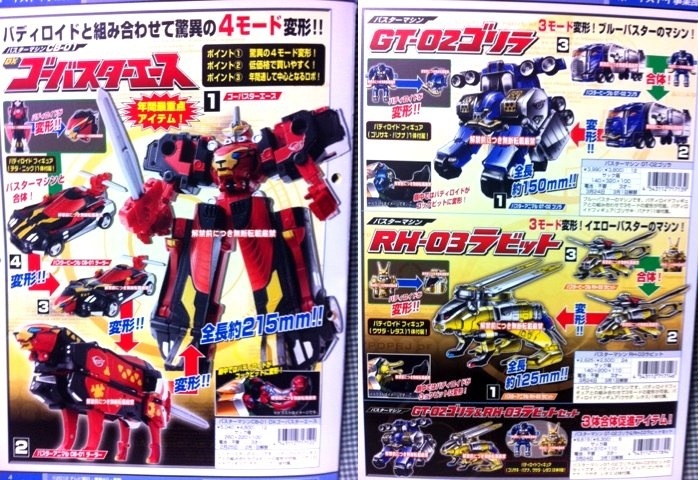 The three mecha (blue gorilla, red cheetah, yellow rabbit) are companion robots who will work alongside the Gobuster. The three companion mecha will transform into the heads of the larger mecha (a la Transformers Headmaster style). The red cheetah can change between three modes by itself (street racer, animal, robot), while the blue gorilla and yellow rabbit will change into only two modes each (animal, semi-trailer, and helicopter respectively). The three together will make Gobuster-Oh. The henshin device is a wrist-mounted toy with light and sound. When a button is pressed on the 'front', a representation of stylistic sunshades will pop out of the device (but remain attached) for the henshin sequence! There are two standard-issue weapons- a blaster that doubles as a digital camera, and a sword that doubles as binoculars. The two weaponos can be combined to for a super blaster. "A long time ago, among moutains far from any civilization, there was a center researching on human innovation. One day, the main computer of the research became malicious and went berserk. Humanity managed to stop this, and peace came back...or so it seemed. Humans, now in peace, predicting that their enemy could go berserk and attack another time, decided to build giant robots and machine, and trained chosen warriors to fight against it. Finally, this day has come. The name of the team formed to fight against the enemy is Tokumei Sentai Gobusters! Now their battle begin." "Tokumei Sentai Gobuster" (Special-mission Taskforce Gobuster) will debut on Sunday, Febuary 26th, 2012 on the following weekend after the end of the current 35th-anniversary series, "Kaizoku Sentai Gokaiger". I'm kind of on the fence on this one. 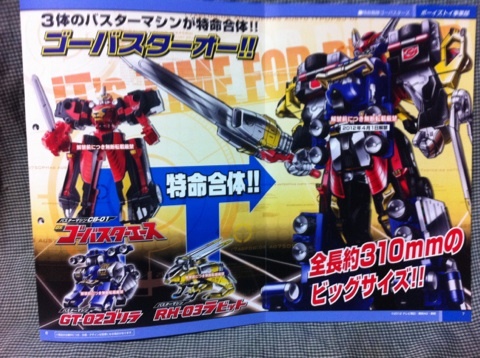 Looks heavily influenced by Goseiger and Go-onger BUT its a triple changer. Let's just wait and see how everything comes into play when the series debuts. And the devices look like the Ghostbusters' PKE meter reader, a camera, and binoculars. Finally Sentai mecha i want and i did like eva vid one thing you didnt notice and i like is they are doing a thing like gosie-Knight in that the partner robot becom the animal head for the mecha. ( If im like the 20th somthing person to say this to you eva im sorry.) 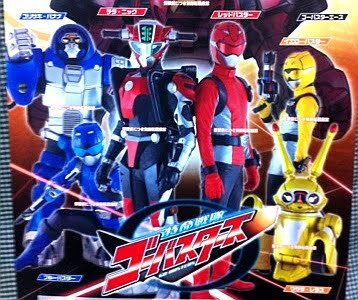 not the suits won me ove the remind od the showa eara sentais like turbo ranger and change man. it simpile but it work really well. and the camra gun bernocal sword that become super gun is just awesome and im so glad to not see the cellphine, also i think the sholder srtaped thing mabey a scanner/hacking thingy. This Sentai being spy themed that would make senice. but all in all i an really digging all this. I like the mecha here although the yellow should have been white (getting tired of the red/blue/yellow sentai deal). We have not seen a photo yet of the DX GoBuster-Oh, but the current theory is that the rabbit mecha takes up all the arms from the shoulders-down, but that there will be no elbow articulation once more. The arms for the red leopard's robo form will probably either fold away before the rabbit attaches, or the rabbit will fit directly over them. The red mecha seems to have some articulation in the elbows, which I hope is in someway presented in the Gobuster-Oh. If it has more articulation than the basic, it might be the first deluxe sized sentai mecha that I will buy. Overall, I like what I'm seeing here. I have high hopes for this Super Sentai. About dekaranger being the last non-phone henshin device. Correct me if I am wrong , but the Dekaranger SP license double as a phone also? Though it also functioned as a communication device, many- including myself- do not count the SP License as a phone changer. Additionally, though it had the appearance of a cellular phone in one of its modes, the toys of it had no working buttons for a keypad. 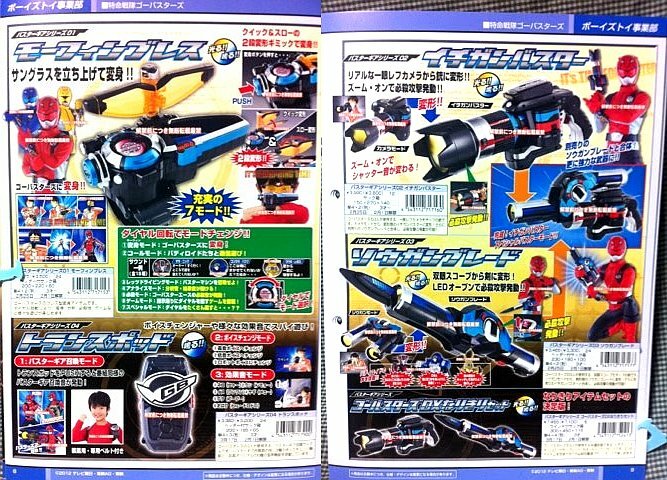 However, the Geki Changer, Gong Changer, and Saidai Blade were the last non-phone changers in a series we got. Before that, then it was indeed DekaRanger. I mean they used it to change, right? And it's not what I'd call a... phone, exactly. That series is not fit to re-enter my memories. I remember they usually used it to communicate amongst the other Dekaranger members , but I think they also used it to call civilians. i have also seen that the red partner robot (called buddy-roid) can turn into a bike for the red buster to use.